Cardio workouts are good exercise to lose weight, and these particular good cardio workouts for men will work well to every man who wants to lose weight fast, and it works fine for me and hopes you too. 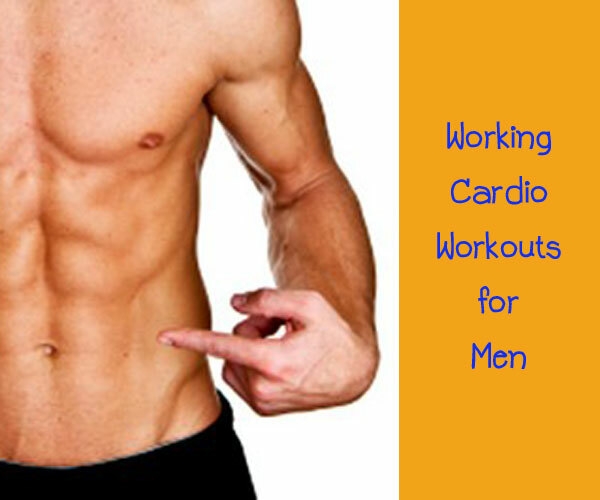 Have you ever tried several of cardio workouts for men but no works? You should know that men have a particular body type, and it should train a number of groups of muscles at once so it will burn more fat and it will be a very fast effective fat-burning exercise you ever do. I highly recommended you do these good men cardio workouts for 3 days each week, which are the most effective fat-burning cardio workouts routine it’s essential that you can manage your metabolism. The key of these cardio workouts is to achieve the certain deal with giving you an increase in your relaxing metabolic rate. If you are doing it correctly you can be burning extra fat 24/7. It’s very cool, right? Before getting into any good men cardio workouts, you should usually warm up first in order to get your heart rate slightly elevated, and then you can start your intervals with twice the rest after each interval. Please remember that you must talk some rest between intervals of cardio workout. Begin with a 20-minute workout and you will start to shed some fat then rest for 1 minute and start doing it again. Following are just a handful of my personal favorite good cardio workouts for men. There are numerous more. However, these will get you rolling. This upper-body power exercise for men is a very good progression from a standard pushup. Start by doing them from your knees and then if you can build up to do explosive pushups from a normal pushup position with your feet on the ground. Try doing this for 2-3 sets of as many reps as possible in your workouts for men. Starting from face up on the floor with your arms and legs straight and then hold your arms straight above top of your head. Following by lift your torso and legs as you’re trying to touch your toes. And then lower your body back to the starting position. a. Your arms should be in line with your body. b. You must keep your head in line to your body and don’t crane your neck forward. Your torso and legs should be in V form, and your legs should be straight. Starting from face up on the floor with your palms facing down and bend your hips and knees 90 degrees. Raise your hips off the floor and then crunch them inward. Pause for a while, and then lower your legs slowly until your heels touch the floor. a. Please hold your feet together. b. You must imagine that you are emptying a bucket of water that’s resting on your pelvis. Your knees must move toward into your chest. Your hips and lower back should rise up off the floor. 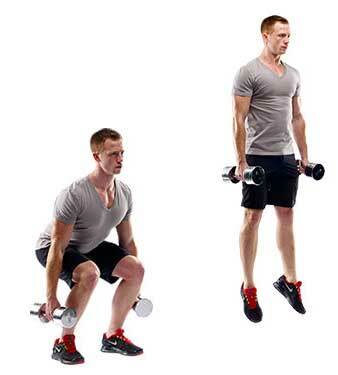 Squat jumps are one of the best cardio workouts for men, and you need to hold a set of dumbbells just makes it even better. You must start from a light set of dumbbells and gradually increase the weight as you get stronger. Do 2-3 sets in your workout for men. This is a powerful exercise for men, and it is a great one for total body power. To do this exercise correctly you need to transfer force from the ground up through your legs, core, then out through your arms. You must have an appropriate medicine ball (4-5 kg is a good place to start), and you can either throw up against a solid wall or to a partner if you have one. Do 2-3 sets during your good men cardio workouts. You can choose any of these 5 power exercises for men into your good cardio workouts for men, get 3 sets of cardio workouts for men each day and watch your performance explode. Previous Previous post: Super Slim Pomegranate Diet Pills Silver Foil – Good or Not?